2: the amazing digital archive project – (see our video “bunker and backstage”). To enter the project database go here: montreux-jazz-digital-project – sign up for free, log-in and enjoy Montreux! Learn about the details of this fascinating project from EPFL documents, including this 2013 brochure. – An incredibly in-depth version was published later in 2015. [40 pages, 130MB PDF, lots of high quality photos] view or download. this post can be viewed as a full width project page here. and also an interactive discovery video 800 songs 1967 onward – worth more than just a visit for sure ! Lots of associated material: images, hashtags, links, etc. As of November 2016 the “Montreux Heritage Lab2” at the EPFL allows access to the archives. Follow their site to check the schedule. 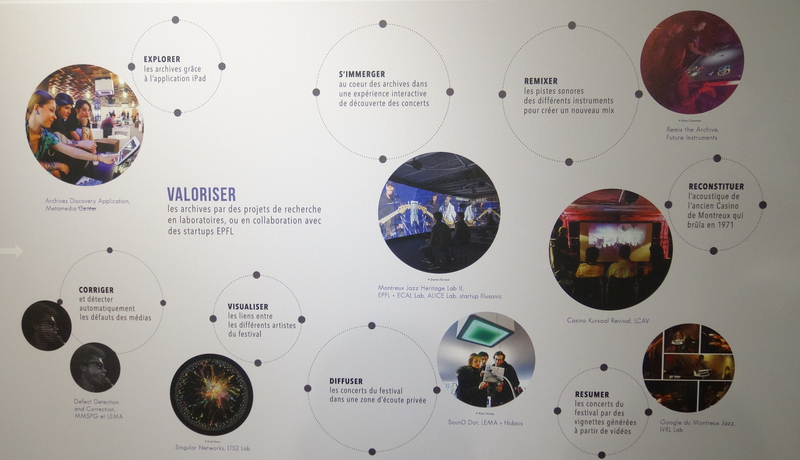 Also check out our visit to the EPFL and the Heritage Lab. 50 years of accumulating recordings, but now progress at the archive project is fast – most mainstream material is already digitized, catalogued, and clearly presented for on-line search. 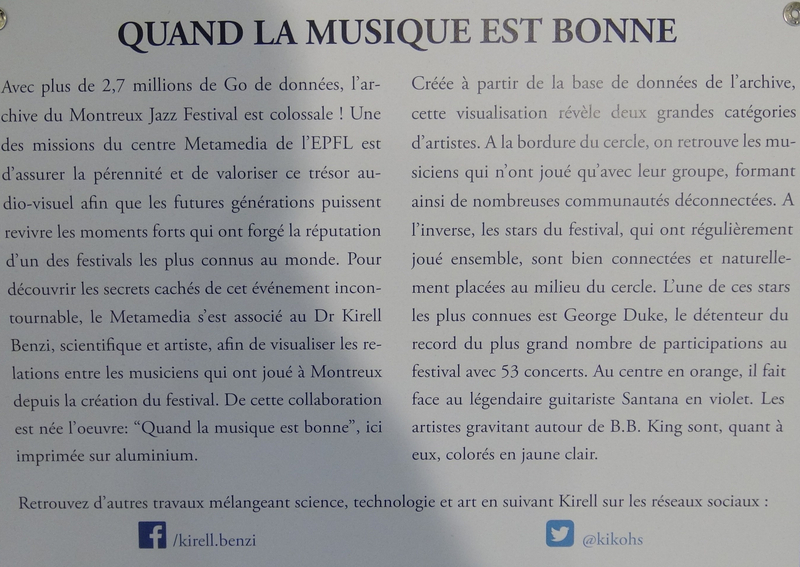 See one sample embedded below, but more importantly sign up for free at Montreux Jazz Live to browse and view so much material (video, audio, photographs, documents) – a great privilege. 50 years playlist retrospective – year by year, 1967-2016 !! Direct link to Ella Fitzgerald, Montreux 1969: In the old Casino which burned down (Smoke on the Water, Deep Purple 1972) in 1971 – note the smoke in the crowd! The Montreux Jazz Heritage Lab is a habitable architectural module that allows the user to plunge into 45 years of jazz, blues and rock concerts in the form of digital archives. The shape of its projection surface, precisely curved in order to enhance embodied user experience, finds its precedents in trompe l’œil effects brought to excellence in the baroque age. This device therefore draws reference from a specific pictorial heritage, combining a corporeal experience of visual content with the archives of musical heritage. The collaboration with the acoustics laboratory LEMA at EPFL had a profound influence onto the geometry of the project and the materials used. The micro-perforated screen offers acoustics transparence, which permits the masking of speakers behind it whilst glass panels located behind the screen equally transmit light. The opening mechanism allows for a folding away of an entire wall as a door, thus allowing the device to be operated in two different modes: acoustically isolated for a small audience inside the space of the module, or open and accessible to a larger audience. Through its transparence and its capacity to modify its configuration, the module becomes an actor in a larger space in which it resides. This architectural module was developed at EPFL ECAL LAB in 2011-12. The Montreux Jazz Festival is one of the most famous music festivals in the world. Starting with Jazz, it has progressively expanded to other genres of music and as always attracted world-class performers such as Queen, BB King, Prince, or Santana. This network shows with whom musicians of the festival play. At the edge of the ring, we have artists who perform only with their band, forming many disconnected communities. In the center are those who jam with everyone, the stars of the festival, well-connected. One of the brightest stars was George Duke, the champion of appearances at the festival with 53 concerts. In the center in orange, he faces the legendary guitarist Santana in purple. This entry was posted in 2016, Digital archiving, Montreux Digital Project and tagged Montreux Digital Project. Bookmark the permalink.